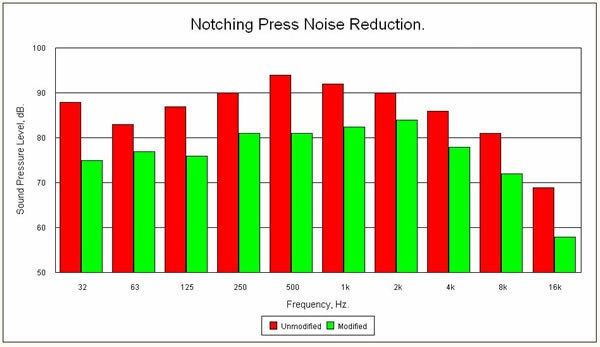 The operator noise level on a notching press used to produce circular laminations, was 97dB. A further machine was to be purchased and it was hoped to develop noise control measures on the existing press that could be applied to the new machine before installation as part of a noise buying policy. Detailed noise and vibration measurements were used to diagnose the fact that the dominant noise source was impacts from the pneumatic interrupter block radiated by the machine frame. Two modifications were developed to reduce the impacts at source. The first involved partial isolation of the actuator block from the machine frame. The second modification was to redesign the anti-spalling end-stops to provide significant cushioning of the impacts. Secondary measures involved increasing the mass of the existing fibreglass covers and the inclusion of acoustic absorbent inside. Combinations of vibration isolation and control of impacts on end-stops etc. are very effective low cost noise control techniques where impact related noise is dominant. 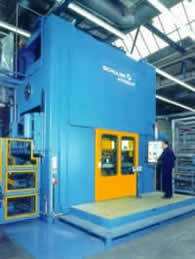 Moreover, this is an example of a case where engineering control techniques not only reduced noise levels, but also improved the operation of the production machine. These measures reduced the operator noise levels from 97dB down to 88dB (a noise reduction of 9dB) without affecting normal machine operation or accessibility. In addition, there had previously been stoppages due to fracture of the interrupter linkage caused by the sharp impacts. The modifications to reduce the noise also control the force of the impacts, greatly reducing the likelihood of future fracture and unexpected down-time. Material costs amounted to approximately £30/machine. Manufacture and fitting of the modifications required a fitter for approximately half a day.